Today is my favorite day of the week. Wednesday. Why? Because of this wonderful new way to get through the “hump day” to once again fascinate on a female foodie. 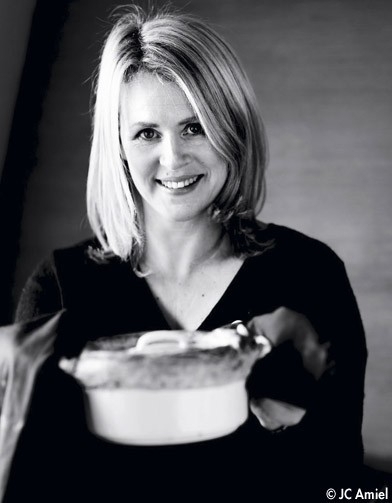 Today we are celebrating none other than chef, author, and food writer Trish Deseine. I had an epiphany while out on a walk with my pretty pit Stella this morning. It struck me that today is the third Woman Crush Wednesday we’ve done here on YDP. And three being a very significant number in Irish history and folklore. Ah, yes, it was our dear St. Patrick who used the beloved shamrock to illustrate the meaning of the Holy Trinity to convert the then pagan people on the Emerald Isle. Since our beautiful and amazing Ms. Deseine is in fact the third in this weekly installment and has only recently returned home to God’s Country after 25 years of living in France, I thought, how perfect! To top it off, her new cookbook is based on Irish recipes and is aptly title “Home”. Okay, now that I have a massive lump in my throat thinking about when my return to Ireland might be, I am going to give you a snippet of this famous chef’s accomplishments. Chances are, you probably already know about her. Besides her stunning television cooking shows, she has sold a whopping one million plus cookery books and has won numerous awards for them to boot. She has made French food, and in particular cooking it, obtainable for us normal folks. And she has done all of this while living in a “foreign” country and raising four gorgeous children. I use quotations around the word foreign because it might feel that way for people that don’t speak the language or understand the culture. But as Trish is fluent in French and truly immersed herself in Parisian life, she made it seem effortless when we all know it isn’t. Though no trace of an accent when she is speaking French, which is in fact her second language, it is only when she speaks English that you hear she still has that lovely Northern Irish lilt that is so endearing. She and I have a lot in common. We were both born in 1964, we are both divorced from the fathers of our children, and we are both unabashedly and unapologetically chocoholics! Though I have never met her and don’t own any of her cookbooks (the only reason being that, I think I might have mentioned to you before, I was put on a moratorium from buying any more cookbooks) I have a major crush on her. Like seriously! I mean, infatuation city! When my Hubby and I first moved to Dublin in 2008 we didn’t own a television for the first 8 months. I am not a big tele person anyway, I prefer to read, so I didn’t miss it quite frankly. But when we finally got a T.V. my Hubby watched Sentanta Sports (MMA Ultimate Fighting, guy stuff) and I would watch Trish’s cooking shows. To be honest, I was never one to watch cooking shows prior to that. When I lived in the U.S. the Food Network was all the rage. But I hadn’t embraced it at that point. However, Trish’s relaxed, warm, and dare I say, sensual way of presenting her French food literally had me enraptured. Let’s also talk about her writing…she is without a doubt one of the best food writers ever published! The way she speaks of food I feel as though I am a child hearing a calming nursery rhyme before bedtime. She lulls you into an intoxicated dream like state and you can literally see with vividness what she is describing! And yet all the while her style is approachable and accessible. For instance, when I read this article she wrote for the Irish Times at Christmas it made me feel cold, warm, hungry, full, nostalgic, happy, etc. etc. etc. all in one! Talk about delighting the senses! Wowza! I’ve read some articles comparing Trish to other chefs. They say she is the Irish equivalent of U.K.’s Nigella Lawson, and the U.S.’s Ina Garten. But I think each of these women stand on their own merits, and as all of us are unique individuals, no one can be us. We can only be a better version of ourselves! And I think that with Trish “coming home” to Ireland, the old sod, she will continue to blossom and reveal all sorts of culinary wonders! Because now she will have such amazing ingredients from which to choose. You do know that Ireland has the best raw materials and food stuffs the world has to offer don’t you? So today, I would like to reignite your love affair with her and encourage you to go and buy her new book. I might have to get a special dispensation just this once and buy it myself. Or dig out one of her older ones from your shelf and have a crack at some of her classic recipes . And if you haven’t met her before, then I am happy to introduce you to her! This is one blind date you will never forget! 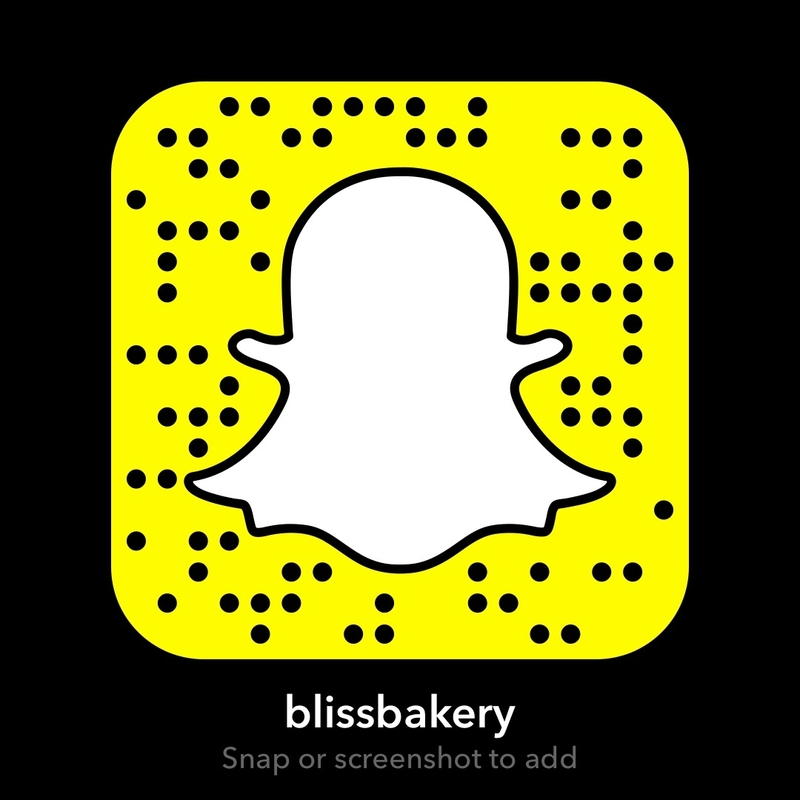 As per usual with these #WCW I will be doing a snapchat tutorial so you can always follow along with me (user name: blissbakery) but it sadly disappears within 24 hours. I have left this recipe for her Irish Apple Cake in tact, just as she has written it, because I shall not breaketh thy words of thy master (or mistress in this case)! You’ll notice I’ve put all her words in quotation marks. And you might want to see the ethereal and effortless way she has photo styled her cake on her website here. There are as many versions of this in Ireland as there are shapes of apples, it would seem. 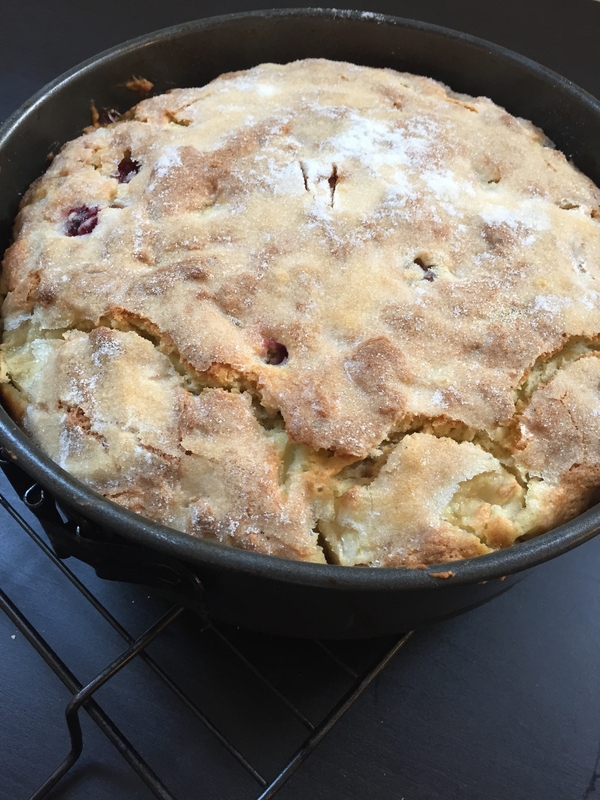 As the recipe has been handed down orally, or scribbled on the back of an old shopping list, or the margin of a cookbook, it has slowly evolved and multiplied, winding its way across the branches of many a family tree. Sift the flour and baking powder into a large mixing bowl. Cut the butter into small cubes and rub it through the flour with your fingers until the mixture looks like breadcrumbs, then stir in the sugar. Peel, core and chop the apples into 2cm chunks. Toss them through the flour mixture. Beat the eggs and milk in a separate bowl and stir in the vanilla extract. Pour the batter into the mixing bowl and mix it in with a wooden spoon or spatula until just combined into a thick dough. Be careful not to work it too much. 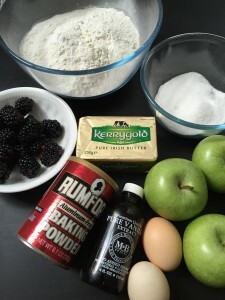 Add the blackberries now if you are using them. Tip this dough into the prepared cake tin and smooth the top with the spoon or spatula. Sprinkle the sugar over the top of the cake and bake for 45/50 minutes, until it is well risen and slightly golden and cracked on top. Test the cake with a knife or a skewer, which will come out clean if the cake is baked. Remove from the oven and leave to cool for 10 minutes or so in the tin before turning out onto a wire rack and leaving to cool completely. I have mentioned before, I am not a writer, I am a share-er. I am not a photographer. I only take pics on my little ol’ iPhone 6 for the purposes of showing you the before (ingredients) and the after (final result) of the recipes. 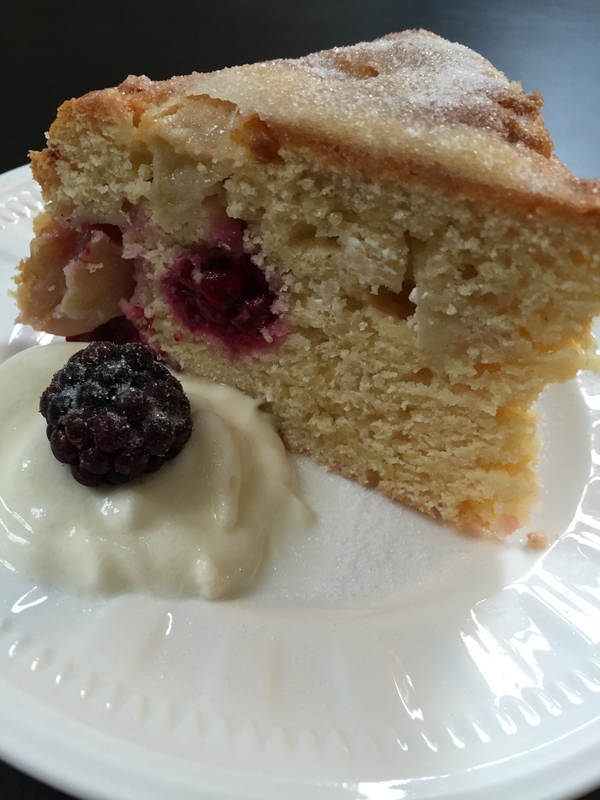 As you can see from the above pic the cake is out of the oven, and cracked on top, for the hoped for final result. As well, I am not a professional food blogger. I am using this blog as a medium to share my passion for food. I am not food stylist either. Most of the time because I am so food focused I want to rush through the taking of the pic so I can eat, asap! But I AM a trained professional chef, however, there is always more to learn and explore. 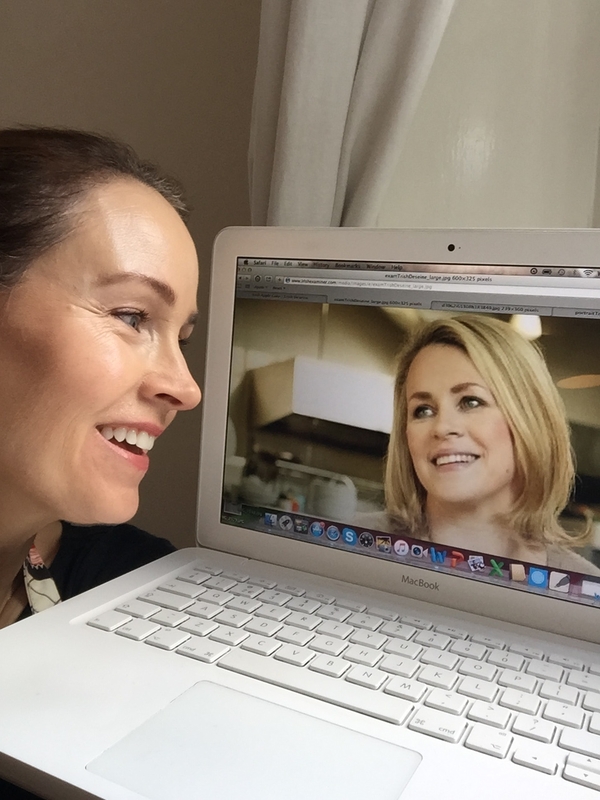 And learning from others like Trish Deseine is such a rewarding experience. I do hope I get to meet her someday. She seems quite genuine. I follow her on twitter and I noticed that she engages in what I call a #mutualadorationsociety and often gushes to and about other chefs. In such a competitive world that we live in, it is refreshing to see that. Especially, as I have said before, in the food industry which is dominated by males. At times females clawing their way to the top in any business can forget to lend a hand to a “sister” but not Trish. She is not only generous but also a class act! So thank you Trish for being your exquisite and inspiring self and sharing all of it with us, your foodie fans!